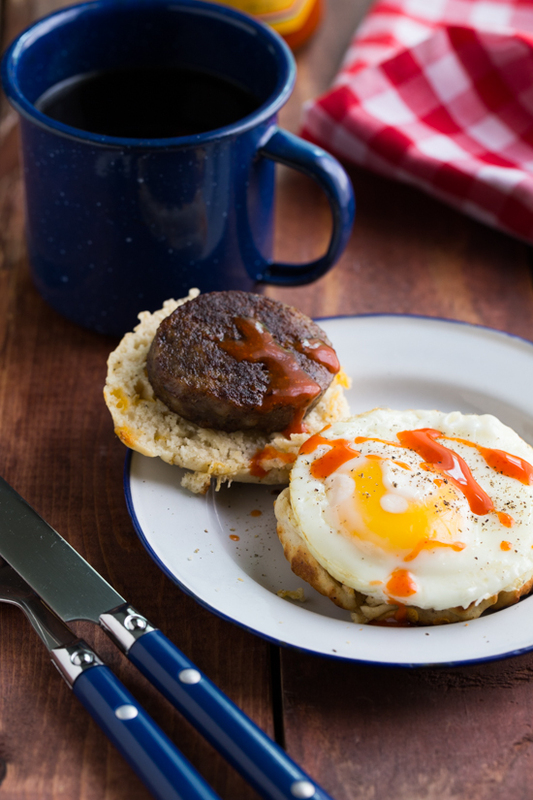 Campfire Breakfast Burgers made with homemade black pepper biscuit mix is the perfect, hearty camping breakfast! Right on the heels of Father’s Day, I’ve got a special post that is centered around the men in my life – particularly the two that I live with. My husband and the Buddy are my best guys and this Campfire Breakfast Burger is something that both of them absolutely love. That’s not to say that the Baby and I don’t like it, too, because we do. Trust me…we do. It might be the runny egg thing, or the sausage patty thing. 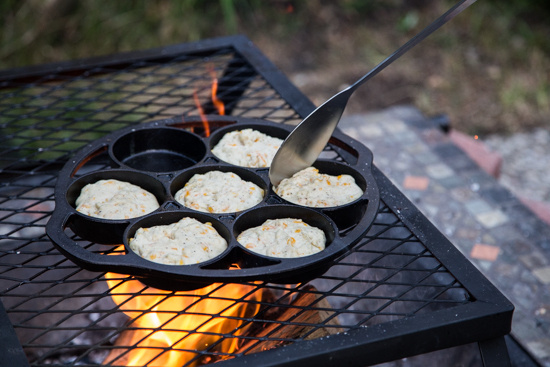 Or it could be the homemade black pepper cheddar campfire biscuits that get me going. Either way, it’s safe to say that all of those components put together make up this killer breakfast burger. 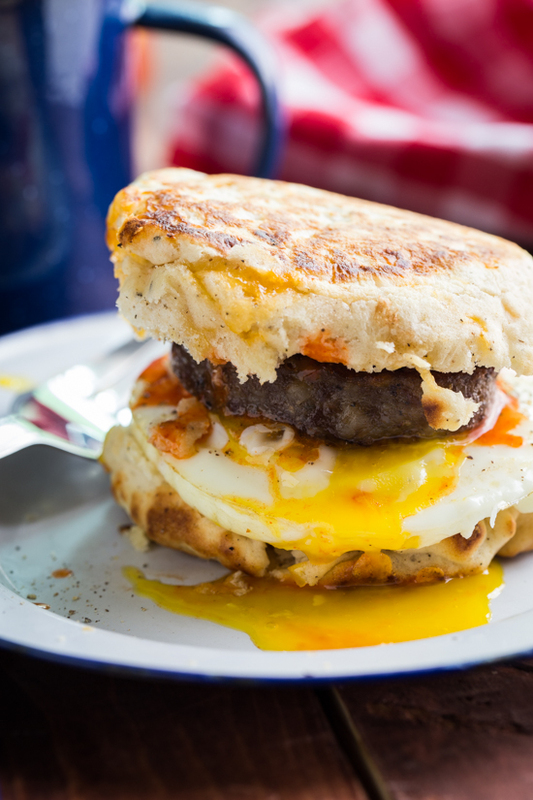 These Campfire Breakfast Burgers is our go-to camping meal. 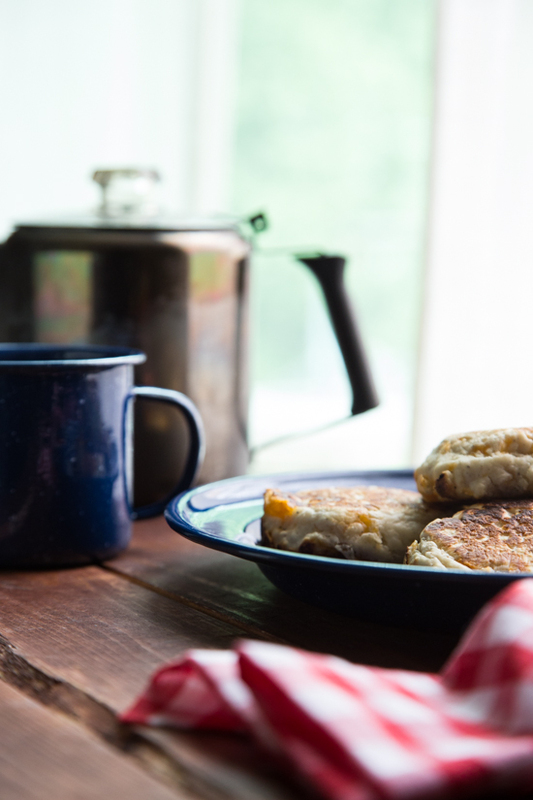 Just about every time our camping gear is spread out, these sausage biscuit sandwiches aren’t far behind. Most of the time we make this for breakfast, after a serene night in our tent, but in truth this burger works just as well at dinner time. They start with a homemade black pepper biscuit mix that you can make ahead of time and bring with you to camp. All you have to do is add water and you’re in business. My black pepper cheddar biscuits are a spin on Lillie’s, from Butter Me Up Brooklyn, campfire biscuit mix. It’s a great base mix to play and experiment with. For these savory sandwiches, the black pepper and cheddar are a superb combination. I’m ridiculously attached to this pan. And when it comes to cooking these burgers, it pulls double duty. First, I get the sausage going in my Lodge skillet. 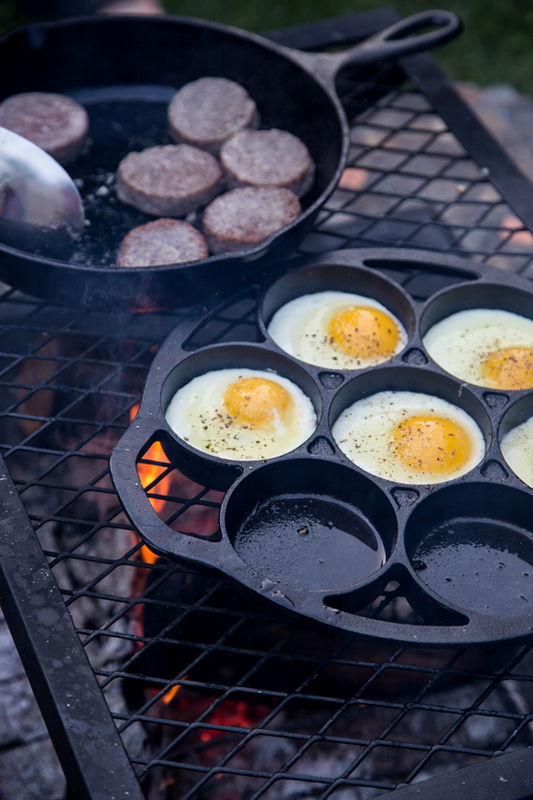 While that is sizzling away, I cook up the biscuits in the biscuit pan, followed by cooking the eggs. 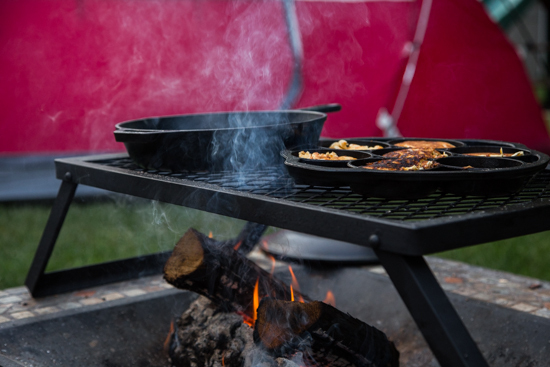 Cooking the eggs in the drop biscuit pan keeps them perfectly sized for the biscuits and sausage patties, all the while imparting a smokey campfire flavor to the entire sandwich. We whipped up a batch of these burgers last weekend as a kick off to the camping season. Camping is one of our family’s favorite activities to do together. Good old fashioned family time, out in nature (or in our backyard if we’re feeling a little lazy), enjoying the weather and the food, as well as each other’s company. The kiddos joy at camping is impossible to avoid. You can’t help but smile when you see how happy they are after we’ve set up camp. 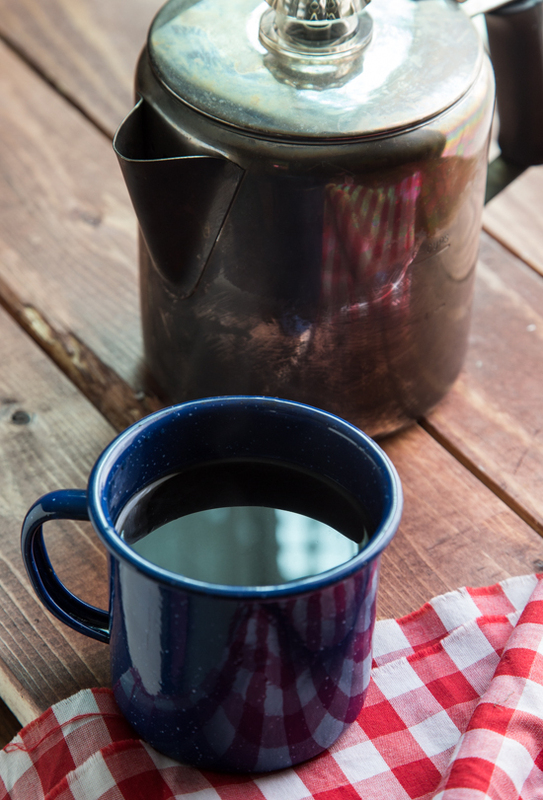 Throw in a cup of campfire coffee and you have my definition of a pretty perfect weekend. I wouldn’t turn down s’mores and some campfire popcorn, either. 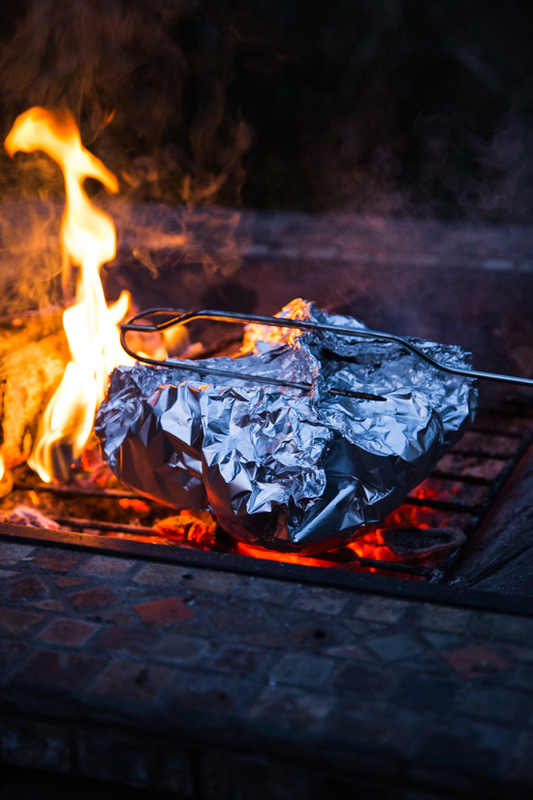 So when I think of burgers, my camping weekends are one of the first things that come to mind. 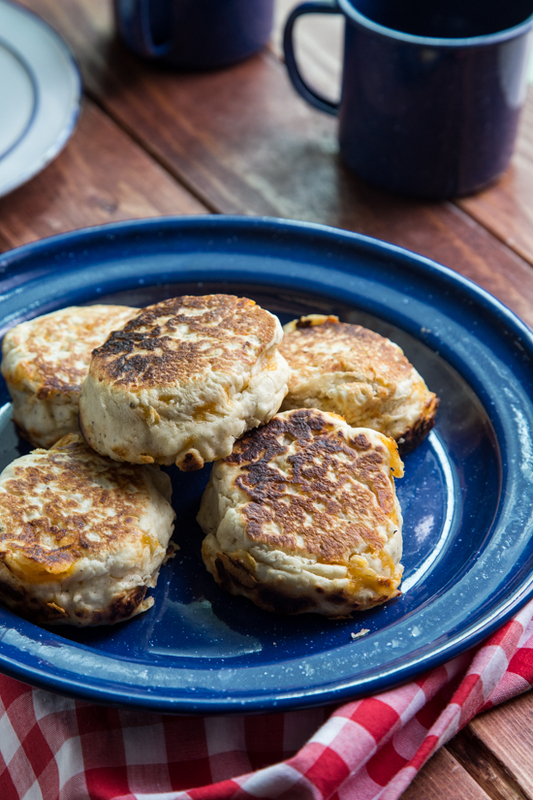 Below is my recipe for the Black Pepper Cheddar Biscuits as well as directions on how to assemble these Campfire Breakfast Burgers (which are really quite simple!). In a medium bowl, whisk together flour, baking powder, sugar, salt, dry milk powder, black pepper and canola oil until well incorporated. (See notes for storage information). To mix the biscuits, pour dry mix into medium sized bowl and add 1/2 cup of water. Slowly add the remaining 1/2 cup of water 1 Tablespoon at a time until the biscuit mix is thick batter. Stir in cheddar cheese. Set cast iron pan over medium heat and add oil to coat. Scoop biscuit mix by the scant 1/4 cup onto pan (you will need to work in small batches). Allow to cook until first side is golden brown and flip once. Cook until biscuits are fluffy and cooked through. Add sausage to a cold cast iron skillet and then set it over medium high heat. Cook until sausages are golden brown and cooked through, flipping once. Remove and set aside. 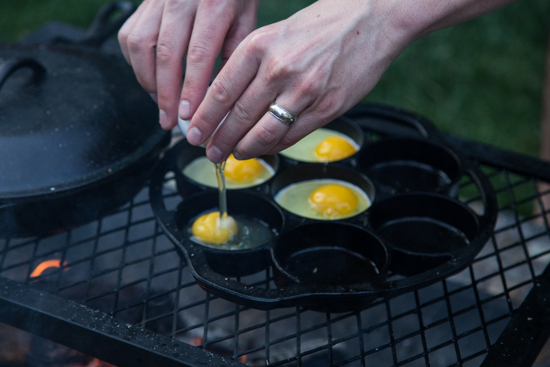 Cook eggs in cast iron skillet until desired doneness (I like my yolks a bit runny). 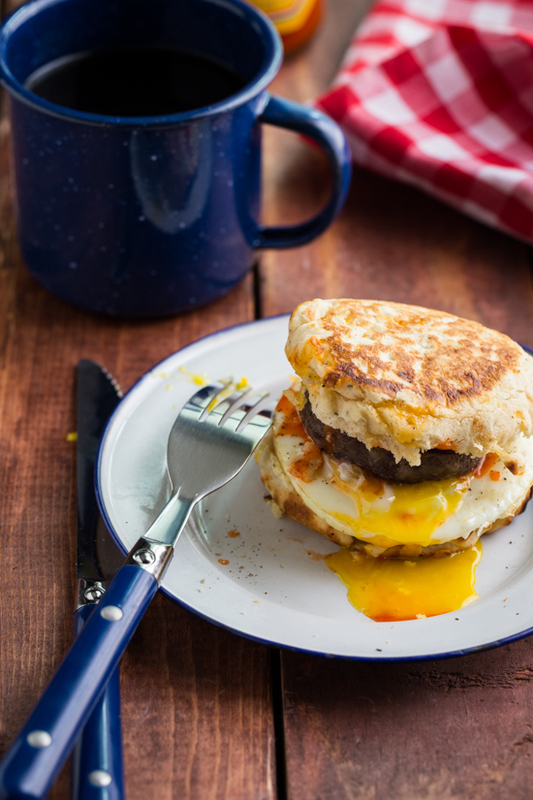 Split biscuits in half and top with sausage and egg. Add ketchup or hot sauce if desired and place other half of biscuit on top. This recipe can be cut in half. Simply prepare only half of the biscuit mix to make 6 biscuits and reduce sausage patties and eggs accordingly. Leftover dry biscuit mix can be stored in an airtight container for up to 2 weeks.